When designing a landscape, a wall makes a perfect final addition, enhancing any area by giving it shape, structure, and style. There is no wall block so suited to the widely varying demands of different landscapes than Western Interlock’s Chateau Wall™. Chateau Wall™ makes it easy to build beautiful features such as raised beds or planters, columns, screens, fire pits or fireplaces, even extensive outdoor kitchens. It is perfect for DIY projects because its modular sizing and mortar-free, glue together construction can be installed quickly and easily by almost anyone with an imagination, much like those little interlocking plastic bricks we’re all so familiar with. Chateau Wall™ comes in four sizes (100×200, 200×200, 300×200, 400×200), along with a beveled piece for making curved features. Because of the 100mm module, blocks can be interchangeably laid flat or laid as jumper blocks that span multiple courses to add visual appeal. Longer blocks can also be laid horizontally so that the extra length protrudes from the wall to create ledges or shelves. On structures like planters or short retaining walls that are visible only from one side, the stones can be staggered in their offset, making the face varied and interesting (see image below). The modular sizing also allows Chateau Wall™ to be installed with a minimum of cuts, as long as the wall length is kept to 4” increments. The rustic tumbled appearance of Chateau Wall™ harmonizes especially well with our Roca surface pavers, allowing you to create any number of exciting combinations. Each individual block is treated to give it a hand-hewn old world look with irregular edges that fit in with the natural Northwest landscape. Additionally, since Chateau Wall™ is a dual-sided block; it can easily be used to create freestanding garden walls or other features that will be visible from all sides. For a varied texture, a block splitter can be used to turn a 400 into two 200s with a rough split face. When these are sprinkled into a wall, it can add an interesting variation in surface texture and serve to break up the field a bit. Chateau Wall™ is also available in five striking colors, designed to complement all of the Western Interlock product lines. Keep it simple with a monochromatic look with your pavers or spice things up a bit by mixing two colors by hand to create a new truly custom color blend. To really set things off from the paver surface, try using a contrasting color such as Charcoal to build your wall. When creating a free-standing garden wall, short retaining wall, planter box or fire pit, Chateau Wall™ is self-capping. For garden walls, lay a 300 block sideways, creating the perfect cap with 50mm (2”) of overhang on either side. 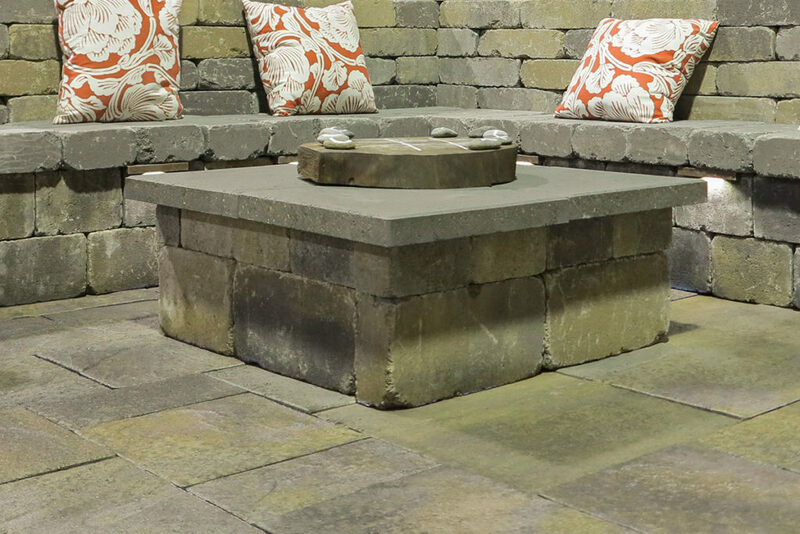 For fire pits, simply add one piece of Chateau Wall™ Beveled to the circle. This creates an overhang of approximately 25mm (1”). We also sell precast profiled wall caps, post caps, and fire pit caps to really put a crown on your project. To really set off your design, choose a contrasting color such as charcoal for your cap. The versatility of Chateau Wall™ lends itself to more involved designs such as our fireplace kits or custom outdoor kitchens. By standing 400s on end and spacing them apart 100mm, you can create an interesting open wall with a slatted look. By making a square out of 400s and capping them with four 18” La Lastra™ slabs, you can make a convenient and durable (albeit unmovable) coffee table. Our Chateau Wall™ fire pit kits are round, but don’t let that hold back your creativity. Use 400s to make a rectangular fire pit and top it with some precast profiled caps. Open new horizons in wall design with Chateau Wall™. The options really are endless. 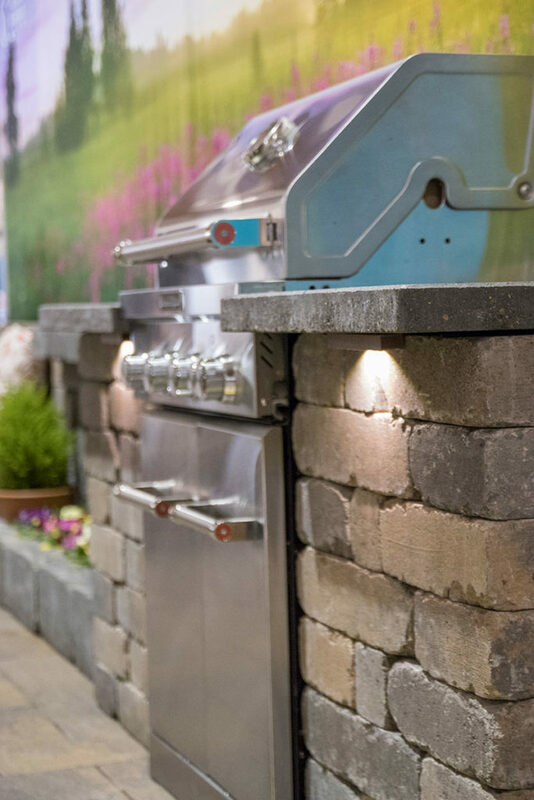 Chateau Wall™ adapts easily to most major brands of outdoor kitchen appliances.